We rarely have the chance to peek behind the curtains and have a look at some of the prototypes that handset makers are testing before unleashing new products on the market. BlackBerry isn’t making phones any longer, but three years ago the Canadian company tried a comeback in the smartphone market. One of the devices that should’ve heralded BlackBerry’s return was codenamed “Ontario.” The first information about the smartphone leaked about three years ago, around the same time we heard about the BlackBerry Passport. BlackBerry Ontario was supposed to pack a Qualcomm Snapdragon 800 processor, 2GB RAM and the brand new BlackBerry 10.3 OS on board. The Ontario would have been BlackBerry’s new flagship replacing the Z30 back in 2014. Unfortunately, the Ontario had never seen the light of day, while the BlackBerry Passport made it to market in fall 2014. 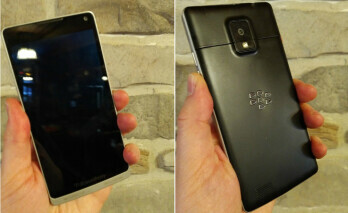 A couple of pictures of the canceled BlackBerry Ontario reveal an all-touch smartphone, unlike the Passport which comes with full QWERTY keyboard. It’s unclear why BlackBerry decided to ditch the Ontario in favor of the QWERTY-based Passport, but the latter hasn’t debuted to raving reviews at all.